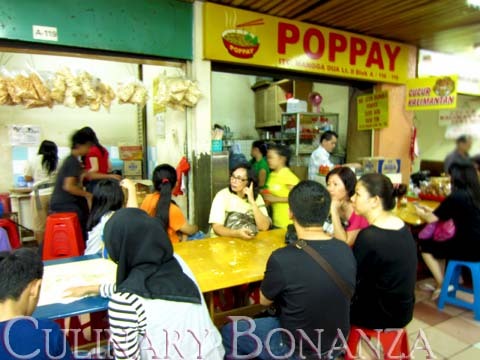 People Would Queue 1 Hour for Bakmi Poppay. Would you? I just can't fathom why some average restaurants are always packed, while some others which actually serves great food, are not so lucky with their fortunes. 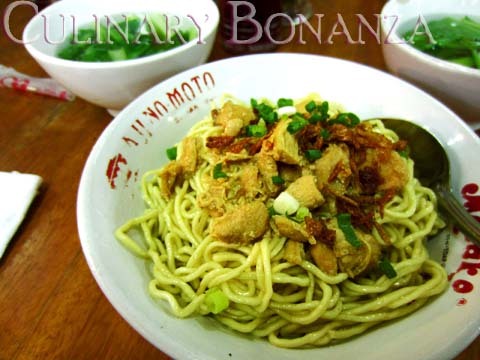 One such place that puzzles me beyond anything is Bakmi Poppay at ITC Mangga Dua. Bakmi Poppay has actually been around for years, but I only managed to muster enough patience to wait and queue sometime ago. Just for the sake of finding out what's so special about it, that people are willing to wait, cut queues and squeeze in the tiny space and not exactly comfortable seats, to eat here. It happened on one sunny weekday, I and my sister arrived before 12 noon only to find the only shop that was still closed inside the ever-bustling ITC Mangga Dua, a must-go shopping haven in Jakarta where you can find good stuff at good prices - if you have sharp eyes and killer bargaining skills! So I waited outside the stall for 30 minutes when 2 staff arrived. Even they were still waiting for someone else who held the keys. What began with only me as the expectant customer, soon grew to a mob of eager and hungry shoppers impatiently waiting for the kitchen to open. I was appalled by their "manners", these shoppers won't look out of place inside a posh shopping mall, but looks may deceive, as the old saying goes. When it comes to tummy matters, be warned, these folks could be the most barbaric and ruthless thugs that you won't want in your way. Guess what? Right when the store's railings were lifted up to the ceiling, before even the tables and plastic stools were properly arranged, impatient customers (excluding me) already helped themselves with the plastic stools which were still laid upside down! One lady particularly annoyed the hell out of me with her boorish manners. She came sometime after me, but she was among the more aggressive ones and she acted like she's a regular customer there! Fortunately, despite all the shuffling and fighting for space, stools and tables, the staffs still noticed who came first. Despite being seated at the corner most of the table at the end, they approached me first to take down my orders. All hails to justice and decent manners! We both had the Mie Ayam Bangka, which came with a bowl of clear caisim soup. My verdict? To be very honest, I couldn't find anything extraordinary form the noodles. It's nothing I cannot find on the streets. The noodles were rather thick (for my standards), the diced chicken for topping was pretty ordinary. But the fried shallots and spring onions rescued the whole ensemble (or is it because I am terribly partial for fried shallots?). We also had the Pempek for takeaway, which was pretty decent, but very oily. And who says you can't have a decent dessert when eating cheap? 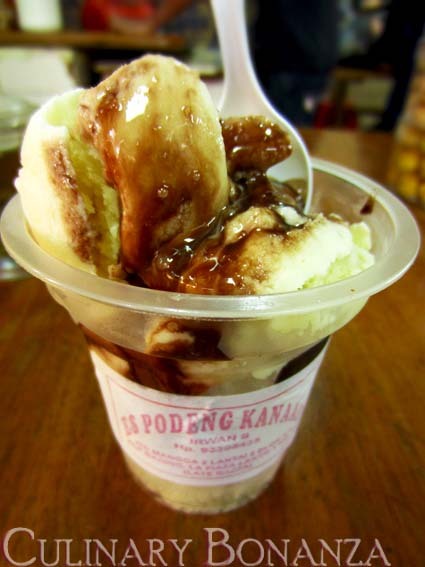 Just a few metres right next to Bakmi Poppay is Es Podeng Kanaan. Don't be decieved by its humble appearance, the mobile glass cart packs a cartful of delightful icy treat: Es Podeng, which is an Indonesian coconut-based home-made ice cream (locals call it es puter), with creamy texture (must be from the coconut milk), and with coconut shavings, sliced avocado, jackfruit and bread loaves, topped with chocolate condensed milk and chocolate rice. 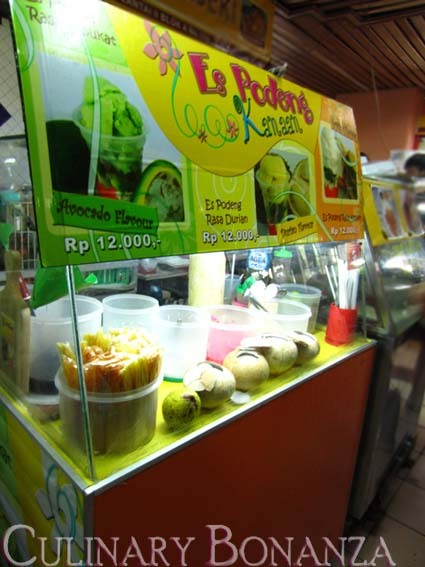 You could choose from the 4 flavours: Avocado, Durian, Kopyor (coconut) and original. We chose Es Podeng Durian, because it was the most unusual of all, as Es Podeng itself already contains avocado & coconut in it, so there was no point in ordering something similar. My conclusion, if you're very curious about what Bakmi Poppay is all about, then you should try it. 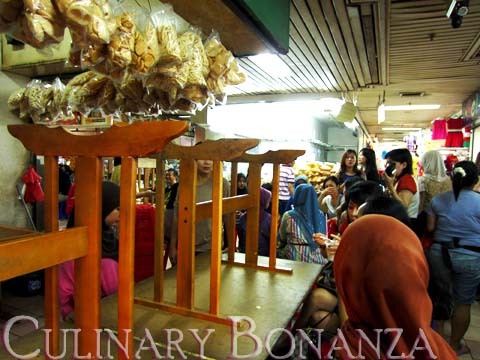 Try going the the Jelambar outlet, who knows the customers are less barbaric there? Food wise, I reckon it is quite good and affordable. But will I wait for hours and jostle with other people for this? I guess occasionally I would, only when I really have all the time in the world to kill! Now the question is: Would you? *) No tax nor service charge. No tip is expected. Just when the railings were lifted up the ceiling. Notice how many people were already waiting? I'm extremely curious now, but I think I won't wait for one hour just for a bowl of the noodles. And yes, sometimes enci" can be really annoying yeah?